2010.09.16 – LA Times Blog by Tiffany Hsu – Three fuel-efficient cars win Automotive X PRIZE competition. 2010.06.24 PIAXP Knockdown Stage Highway Efficiency Test E-Tracer #79 (Photo by Stefano Paris). 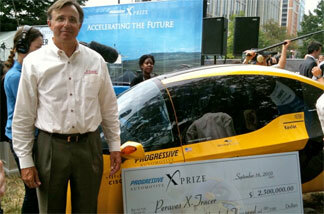 2010.09.16 – Autoblog Green – Automotive X PRIZE: E-Tracer captures victory in Alternative Tandem Class. 2010.06.28 – E-Tracer #79 running the PIAXP Dynamic Lateral Acceleration Test (Photo by Stefano Paris). 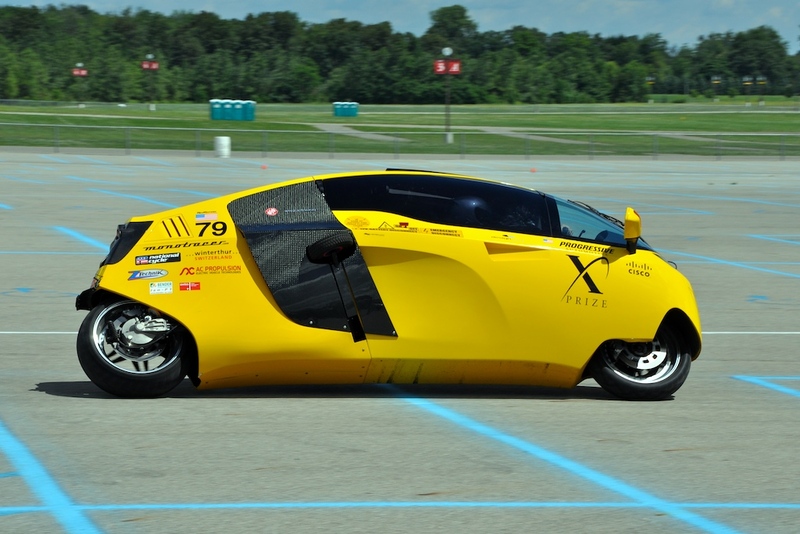 2010.09.16 – earth2tech – And the Auto X PRIZE Goes to…A Very Light Weight Car. 2010.09.16 – CNET Reviews – cartech blog – X PRIZE winner E-Tracer powered by AC Propulsion electric-drive system. 2010.09.16 – Wired Autopia – X PRIZE Winners Look Weird…With Good Reason. 2010.09.16 – Kitty Felde from Southern California Public Radio 89.3 KPCC interviews AC Propulsion President and CEO Tom Gage on enabling the Swiss firm Peraves win the Progressive Insurance Automotive X PRIZE. Don’t miss the KPCC audio MP3 of the interview. 2010.09.16 – AX Propulsion’s Tom Gage with PIAXP winning E-Tracer #79 and award check (Photo by Kitty Felde/KPCC). 2010.09.16 – PIAXP Trophy and winning E-Tracer #79 (Photo by Kitty Felde/KPCC). 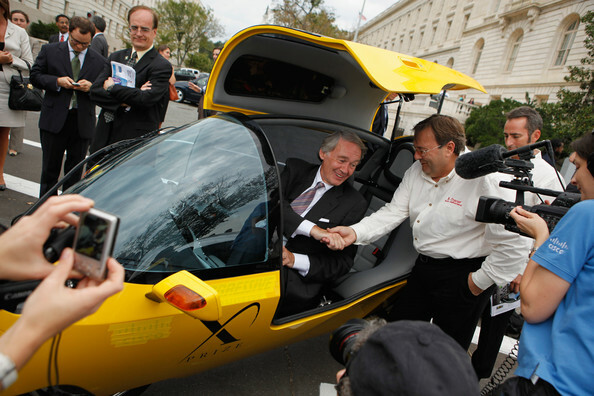 U.S. House Select Committee on Energy Independence and Global Warming Chairman Edward Markey (D-MA) shakes hands with Peraves Winterthur CEO Roger Riedener while sitting behind the wheel of the X-Tracer Team Switzerland “E-Tracer #79,” the Automotive X Prize Alternative Tandem Class winning vehicle outside the U.S. Capitol September 16, 2010 in Washington, DC. 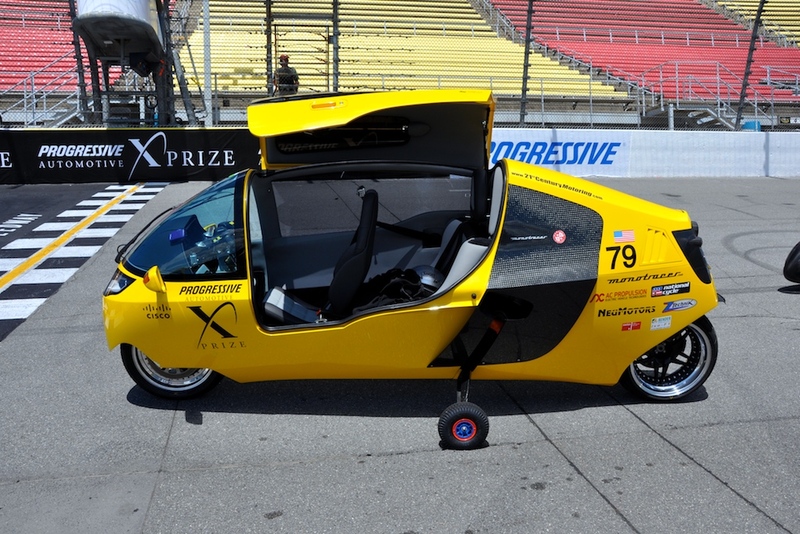 Sponsored by Progressive Automotive Insurance, The three X Prize winning vehicles emerged from an original field of 111 competing teams, representing 136 vehicle entries from around the world. Each vehicle is capable of achieving better than 100 miles per gallon or the energy equivalent (MPGe). 2010.09.16 – E-Tracer #79 visits the U.S. Congress. 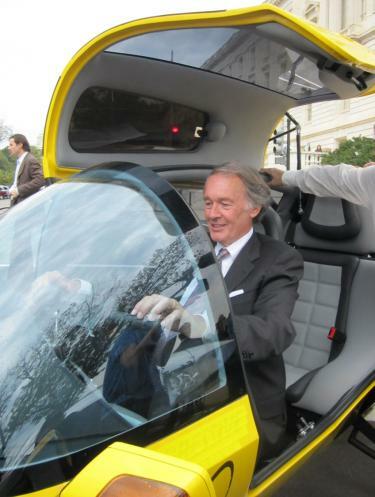 Massachusetts 5th District Congressman and Chairman of the Select Committee on Energy Independence and Global Warming Ed Markey sports an all electric smile in the X-PRIZE winning X-Tracer (electric MonoTracer). 2010.09.16 – E-Tracer #79 visits the U.S. Congress. 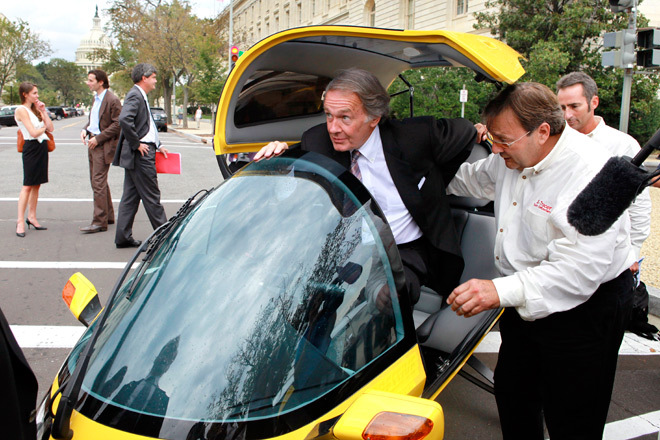 Massachusetts 5th District Congressman and Chairman of the Select Committee on Energy Independence and Global Warming Ed Markey takes a seat in the X-PRIZE winning all electric MonoTracer. (Photo by Jacquelyn Martin/AP). Click here to watch Massachusetts 5th District Congressman and Chairman of the Select Committee on Energy Independence and Global warming Ed Markey speak at the Progressive Insurance Automotive X-PRIZE awards ceremony at minute 33. This entry was posted in PIAXP X PRIZE and tagged AC Propulsion, Chairman Ed Markey of the Select Committee on Energy Independence and Global Warming, dynamic tests, E-Tracer, Ed Markey, Knockdown Stage, KPCC, Massachusetts 5th District Congressman Ed Markey, PIAXP, Tom Gage, X PRIZE. Bookmark the permalink.